During the 1990s, many scientific publications, economic manuals and mass media pundits held that a correct representation of the industrial history of the 20th century would break this period down into three phases. The first phase was thought to involve “semi-craft” production, characterised by a wide variety of goods made by self-organised professional workers seeking to satisfy a demand that emanated from the upper social categories, these being the only persons who could access such custom-made items. Then came a phase of “mass production”, characterised by the manufacturing of large series of standardised goods by unskilled workers whose efforts were strictly defined and prescribed. Thanks to the economies of scale that were made possible by this system, it was supposedly during this period that the working classes acceded to a consumption of industrial products. Lastly, the century’s third and final phase of productive activity, called “lean production”, was said to have appeared in the 1990s, first in Japan before diffusing across the rest of the world. This system was said to have enabled a manufacturing of diversified, high-quality and competitively priced goods, thanks to employees’ and suppliers’ joint efforts towards a continuous improvement in performance (the purpose being to satisfy a market that was becoming increasingly competitive and globalised). This final phase was said to have signalled the end of the so-called Taylorian division of labour, assimilated with a separation of design and execution. The MIT (Massachusetts Institute of Technology) researchers put together an International Motor Vehicle Programme (IMVP) to orient research into automobile manufacturers and into variations in their levels of productivity. It subsequently devised the lean production theory to account for the system of production it was describing. The IMVP stated that this system “would change the world”, and that it was imperative that American and European firms adopt it (Womack et. al., 1990). This thesis, which was widely successful internationally in both professional and scientific circles, nevertheless raised a greater number of questions, and even outright criticism. This in turn led to a new wave of research throughout the 1990s - initiatives that enabled more operative types of theoretical formulation. The purpose of the present book is to present these latter formulations. History however moves quickly. The “system that was going to change the world” was not able to keep the country where it was said to have originated from going into a protracted and painful crisis. Nor did it prevent some of the companies who allegedly embodied its principles from being forced to ally themselves with (or even be taken over by) foreign groups - only to be restructured and discover that they had much to learn from foreigners who were reputedly less efficient. Methods that had been attributed to the Japanese and which had seduced economic and political leaders (as well as many university professors and researchers) began to lose their charm. One intellectual fashion replacing another, now a new “Anglo-Saxon” model, based on the search for short-term profitability and a consequence of the power that has been acquired by institutional investors (pension funds, mutual funds, etc.) is supposedly forcing itself on the rest of the planet - just as 10 years ago people had been saying that lean production was sure to be the wave of the future. The disillusion is as blinding as it is fascinating. It makes it difficult to learn from the past and causes analysts to repeat the same mistakes - notably that which consists of seeing a new phenomenon as a potentially general and irreversible tendency without first examining the conditions that led to its birth or which are necessary if it is to spread. It is crucial that analysts avoid falling prey to faddish thinking again, whatever the nature thereof. Observers have to engage in conceptual clarifications and carry out meticulous analyses. This has been the goal of the “GERPISA International Network” (Group for the Permanent Study of and Research into the Automobile Industry and its Workers), an association of researchers who have been focusing on the automobile industry in an attempt to verify the validity of the IMVP’s thesis. The GERPISA has been studying automobile firms’ trajectories as well as the spaces in which such companies have deployed their activities from the late 1960s through the late 1990s. This has been achieved via two international research programmes: “The emergence of new industrial models” (1993-1996) and “The automobile industry between globalisation and regionalisation” (1997-1999). The authors of the present book, who managed the scientific aspects of these two programmes, present here the conclusions that they have personally drawn from them, enhanced by findings from research on the automobile industry since its birth. The present book provides an analytical structure that could readily inspire research into other sectors of activity. For the moment, the automobile sector is the only one to have been subjected to systematic investigation at a worldwide level. The stakes are high in this debate. At a scientific level, they involve an understanding of the full diversity of the various forms that the relationship between capital and labour has assumed, wherever this relationship is being renewed on a daily basis (i.e., in those firms and economic and political spaces where such activities are deployed). At a practical level, we focus on the conditions underlying firms’ durable profitability (and thus longevity), thereby assessing the room to manoeuvre for each of the actors involved: shareholders, banks, executives, employees, labour unions, suppliers, the State and local authorities – with consideration being given to each actor’s own economic and social outlook. The first chapter of the present book suggests a framework for analysing the process that gives birth to a “productive model”. The purpose is to build a definition that can be used operationally. The six following chapters are devoted to the “profit strategies” that can become possible, depending on the state of the market or labour; and to the “productive models” by which these strategies (such as they have been defined up until now in the automobile industry) can be implemented. Each chapter presents the development of one (or two) productive model(s); the profit strategy it implements; the means it activates; the “company governance compromise” in which it is embedded; the firms that have successfully embodied it (and those who have failed); the crises it has known; and finally the future that can be predicted for it. 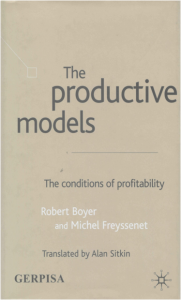 The conclusion provides an overview of the way in which these productive models have evolved over time, and specifies both the conditions in which firms can be profitable as well as the room for manoeuvre that actors have at their disposal. IV/ THE “VOLUME” STRATEGY AND THE FORDIAN MODEL 1. From Ford to Fordism - and back again 2. The gradual and tentative shaping of the Ford production system Mass production and lower prices preceded the introduction of assembly line Uniformisation and integration Wages are doubled to keep workers from leaving The early crisis of the Ford production system 3. The “volume”-based profit strategy An exceptional coincidence of market and of labour conditions Standard products; a centralised and integrated organisation; rising, high and relatively uniform wage levels 4. The Fordian model Building the Fordian model at Ford after the Second World War Volkswagen is the second firm to have embodied the Fordian model 5. Is it possible to revert to a “volume” strategy? VII/ THE “INNOVATION AND FLEXIBILITY” STRATEGY AND THE HONDIAN MODEL 1. The “innovation and flexibility” strategy The unbreakable bonds between conceptual innovation and “reactive” flexibility Original expectations that must be satisfied; opportunistic and mobile employees Requirements that are diametrically opposed to those that can be found in a “permanent reduction in costs” strategy 2. Despite being born in Japan, the Hondian model is the opposite of the Toyotian model Genesis of the Hondian model Engineers at the behest of financiers Staying independent: neither a keiretsu nor an association of suppliers Rapid individual promotion vs. responsiveness and initiative Innovative products; re-convertible equipment and personnel; a double-edged pay system; and better working conditions 3. Success is never guaranteed once and for all 4. The future for the “innovation and flexibility” strategy and Hondian model.